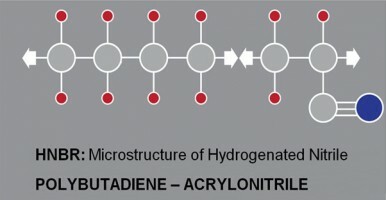 The chemical structure of this elastomer (resulting from the hydrogenation of a NBR nitrile rubber) has improved temperature and abrasion resistance compared to standard NBR rubber, particularly if it is peroxide-vulcanized. Its resistance to oils and solvents is also slightly higher compared to nitrile rubber, with few exceptions. It has good heat and ozone resistance and offers a very wide application range, maintaining its mechanical features in a temperature range from -40°C to peaks of 150°C.